Materstvedt LJ. (2020; TBA). «Ethical issues in physician aid-in-dying». In: Cherny N, Fallon M, Kaasa S, Portenoy R, Currow D, eds. Oxford Textbook of Palliative Medicine, 6th edn. Oxford: Oxford University Press. According to international convention, physician aid-in-dying includes euthanasia and physician-assisted suicide, both of which are voluntarily requested forms of medicalized killings. In the former, a physician injects the patient with lethal drugs, whereas in the latter the patient self-administers such drugs. The two practices differ fundamentally from non-treatment decisions and from the last-resort treatment palliative sedation, and details of the differences are outlined in the chapter. The author shows that physician aid-in-dying differs considerably in appearance, depending on which normative ethical theory is taken as the point of departure and how various theories can be used either to reject or to defend physician aid-in-dying. The author’s specialist field is within philosophical normative ethics; accordingly, other types of ethics derived from other subjects fall outside the author’s field of competence. Furthermore, the chapter demonstrates that many of the arguments for physician aid-in-dying would also justify the controversial practice called life-ending acts without explicit patient request, which is medical murder. The chapter also discusses alternative ways for palliative care physicians to relate to physician aid-in-dying. Materstvedt LJ, Ottesen S, von Hofacker S, Syse A. (2019). «Lindrende sedering: Unødvendig lidelse kan unngås ved livets slutt». Dagens Medisin, 29.1. Materstvedt LJ. (2018). 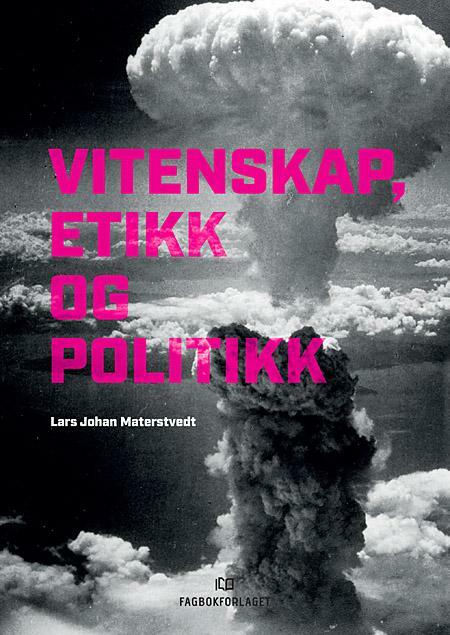 Vitenskap, etikk og politikk [Science, Ethics and Politics]. Bergen: Fagbokforlaget. Materstvedt LJ. (2018). «'Assisted dying' – what it is, where it's practised, and what the future might hold». Discover Society, by Social Research Publications; Category DS53. February 6. Materstvedt LJ. (2018). «Euthanasia is never ‘passive’. Inappropriate definitions may make moral problems more complicated». 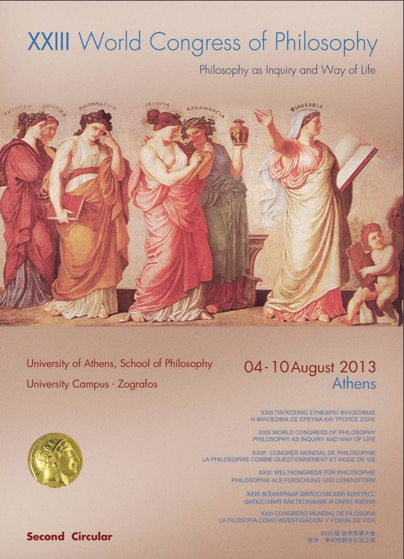 Proceedings of the XXIII World Congress of Philosophy; Vol. 20: 15-21. Materstvedt LJ, Magelssen M. (2018). «Missvisande och felaktigt från Smer». Brev til redaktøren. [Publisert i kommentarfeltet til lenket artikkel.] Läkartidningen, 21.6. Heidenreich K, Bremer A, Materstvedt LJ, Tidefelt U, Svantesson M. (2017). «Relational autonomy in the care of the vulnerable: health care professionals' reasoning in Moral Case Deliberation (MCD)». Medicine, Health Care and Philosophy; Online First: 1-11. Materstvedt LJ. (2017). «Den medisinske selvmorderen i individualismens tid» [Medical suicide in the age of individualism]. 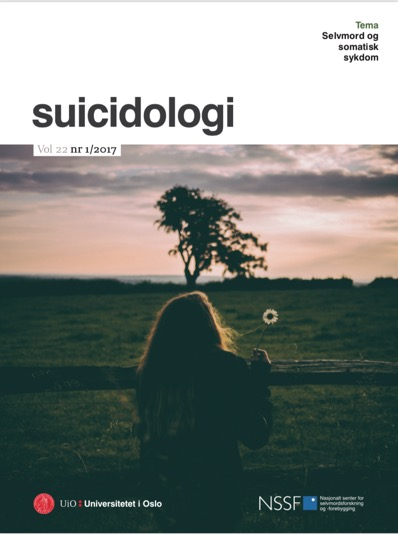 Suicidologi [Suicidology]; nr 1: 4-11. Materstvedt LJ, Magelssen M. (2016). «Medical murder in Belgium and the Netherlands». Journal of Medical Ethics; 42: 621-4. Materstvedt LJ. (2016). «The Norwegian Medical Association's lack of clarity on 'active help in dying'». Journal of the Norwegian Medical Association; 136: 1248-50. Materstvedt LJ. (2016). «Legeforeningens uklarhet om 'aktiv dødshjelp'». Tidsskrift for Den norske legeforening; 136: 1248-50. Balaguer A, Monforte-Royo C, Porta-Sales J, Alonso-Babarro A, Altisent R, Aradilla-Herrero A, Bellido-Pérez M, Breitbart W, Centeno C, Cuervo MA, Deliens L, Frerich G, Gastmans C, Lichtenfeld S, Limonero JT, Maier MA, Materstvedt LJ, Nabal M, Rodin G, Rosenfeld B, Schroepfer T, Tomás-Sábado J, Trelis J, Villavicencio-Chávez C, Voltz R. (2016). «An international consensus definition of the wish to hasten death and its related factors». PLOS ONE 11(1): e0146184. Magelssen M, Supphellen M, Nortvedt P, Materstvedt LJ. (2016). «Attitudes towards assisted dying are influenced by question wording and order: a survey experiment». BMC Medical Ethics; 17: 24. Materstvedt LJ, Kaasa S. (2016). 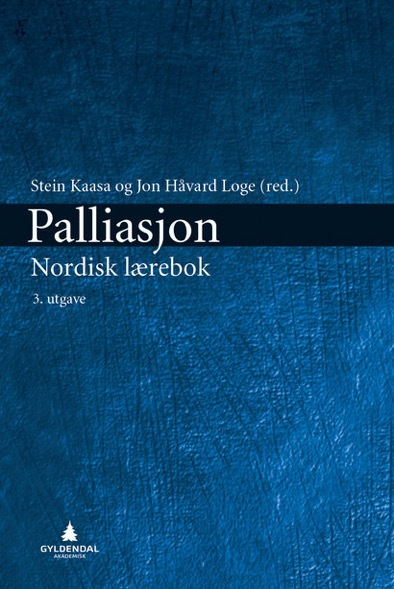 «Palliasjon og eutanasi» [Palliative care and euthanasia]. Kap. 5 i Kaasa S, Loge JH, red. Palliasjon. 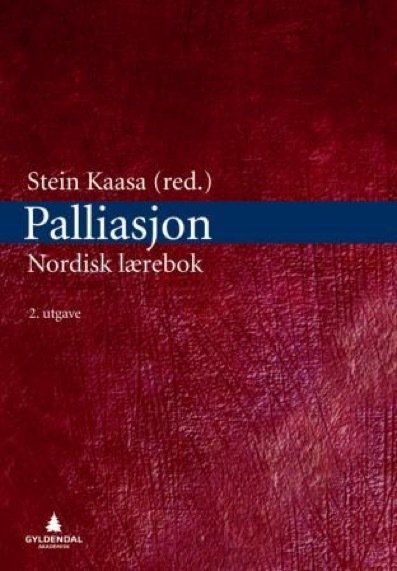 Nordisk lærebok [Palliation. Nordic Textbook]. 3. utgave. Oslo: Gyldendal Akademisk, s. 83-96. Materstvedt LJ. (2016). «Dødshjelp er aldri ‘aktiv’ eller ‘passiv’». [Euthanasia is never ‘active’ or ‘passive’]. I: Førde R, Kjelland M, Stridbeck U, red. 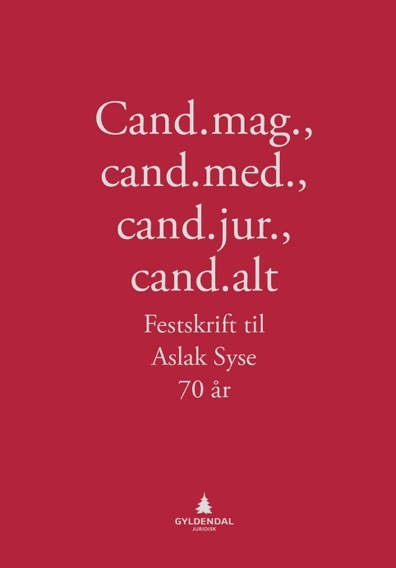 Cand.mag., cand.med., cand.jur., cand.alt – Festskrift til Aslak Syse 70 år. Oslo: Gyldendal Juridisk, s. 345-55. Et av de mange tema som opptar Aslak, er det kontroversielle og komplekse «aktiv dødshjelp» – senest i et kapittel i en ny lærebok i helserett. I temaet «møtes» legen og juristen Aslak. Dette doble inntaket gjør ham til en sjelden fugl blant debattantene. Og sjeldne fugler er verdsatte. Sluttord: Står legenes drapsmonopol for fall? Vil filosofer overta? Materstvedt LJ. (2016). «Are there any (absolute) political obligations?». In: Kjartan Koch Mikalsen, Erling Skjei, Audun Øfsti, eds. Modernity. Unity in Diversity? 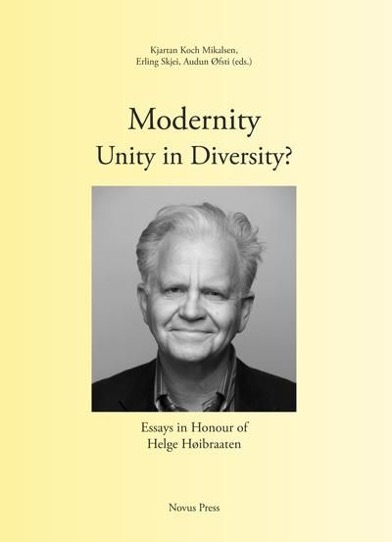 Essays in Honour of Helge Høibraaten. Oslo: Novus Press, pages 195-216. Helge’s interests in philosophy range wide; indeed, one sometimes wonders, what is he not interested in? Furthermore, whatever the subject, for reasons unbeknownst even to those of us who have known him for many years, he always manages to deal with it in ways that are interesting, original, illuminating and, not least, witty – to our ongoing fascination. Nonetheless, it would be fair to say that political philosophy has always occupied a special place for Helge. This chapter addresses certain basic issues within that branch of philosophy. These include whether there is such a thing as political obligation and, if so, what sort of obligation it is; the anarchist’s challenge to the idea of state legitimacy; and the issue of consent to a state, be it explicit or implicit (tacit). In the first part, I point out certain problems with the idea of state legitimacy. The inner-morality constraint: limiting the scope of political obligations? Materstvedt LJ. (2016). «The EAPC on euthanasia, 2003 and 2016». University of Glasgow, Scotland, End of life studies blog, April 5th. Materstvedt LJ, Førde R. (2016). «'Dødshjelp': definisjoner, kliniske skillelinjer, og utviklingen internasjonalt 2011-2016». [‘Help in dying’: definitions, clinical distinctions, and international developments 2011-2016]. Omsorg. Nordisk tidsskrift for palliativ medisin; nr. 2, s. 9-13. Materstvedt LJ, Bosshard G. (2015). «Euthanasia and palliative care». In: Cherny N, Fallon M, Kaasa S, Portenoy R, Currow D, eds. 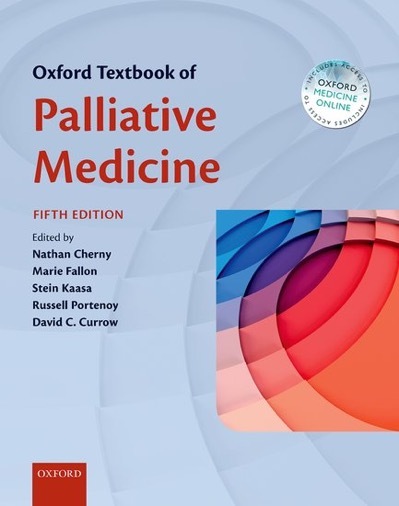 Oxford Textbook of Palliative Medicine, 5th edn. Oxford: Oxford University Press, Chapter 5.7, pages 314-22. 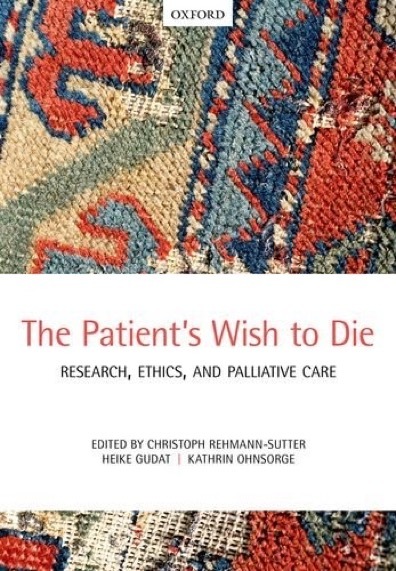 This chapter focusses on the particular relationship and interconnections between euthanasia and palliative care. The opening definition of euthanasia is followed by explanations of what is entailed by physician-assisted suicide and assisted suicide. All three categories are based on patient request, and on using drugs to intentionally induce death; they can be subsumed under the term «assisted dying». Selected key data on these practices are presented. 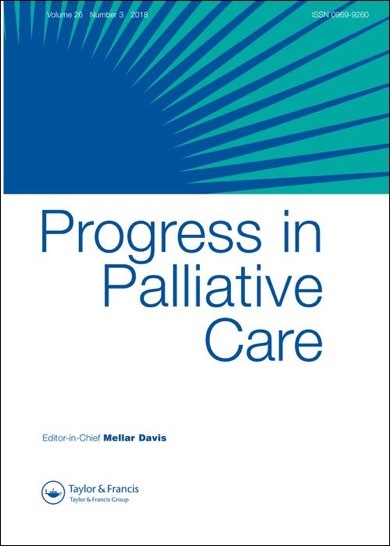 Of central importance is the question of how requests for assisted dying should be handled within palliative care, and as part of addressing this question the chapter includes a discussion of the practice in Belgium, where euthanasia is performed within palliative care institutions. Our in-depth exploration of the requirements to be met in cases of assisted dying where such practices have been legalized demonstrates that certain crucial criteria are notoriously unclear and open to interpretation. Furthermore, we present the Swiss model, which practices a much clearer separation between assisted dying and both palliative care and clinical medical practice. Statements on assisted dying made by key palliative care organizations are then presented and analyzed. We ask whether palliative care is at risk of «sliding down a slippery slope towards euthanasia»; that is, whether the palliative care community will be more accepting of euthanasia in the future, following potential new legislation. Our concluding remarks consider the current reluctance of doctors to participate in assisted dying, and the pressures they are under – from the general public as well as legislative bodies – to accept a role in present and future practices of assisted dying. ASSISTED DYING IN PRACTICE – Frequency – Age groups – Cancer predominant – Relevance for palliative care – Why patients request assisted death – What is a «request»? CONCLUDING REMARKS – Doctors’ reluctance to participate in assisted dying – Doctors caught in the middle – From caring to killing? Materstvedt LJ. (2015). «Caring and killing in the clinic: the argument of self-determination». In: Rehmann-Sutter C, Gudat H, Ohnsorge K, eds. The Patient’s Wish to Die. Research, Ethics, and Palliative Care. Oxford: Oxford University Press, Part III, Ethics, Chapter 12, pages 125-38. This chapter looks at the issue of assisted dying ­– that is, euthanasia, physician-assisted suicide and assisted suicide –­ through the lens of the right to autonomy or self-determination. A key thinker in this connection is Immanuel Kant. It is shown how, within Kant’s philosophical system, assisted dying emerges as morally objectionable. From a legal point of view, however, it is not clear that assisted dying should be prohibited. On this author’s reading of Kant, his view of individual freedom taken together with his division of moral and legal duties, opens up the possibility of legalized assisted dying. Still, this should be based on the premise that such legislation is not a threat to the rights of other individuals. The chapter also discusses the concept of self-ownership in John Locke and Robert Nozick, and connects it with the issue of assisted dying. Further, it is shown that the idea that people are «the best judges of their own interests», which is central to the assisted dying debate, is problematic in principle as well as in practice. 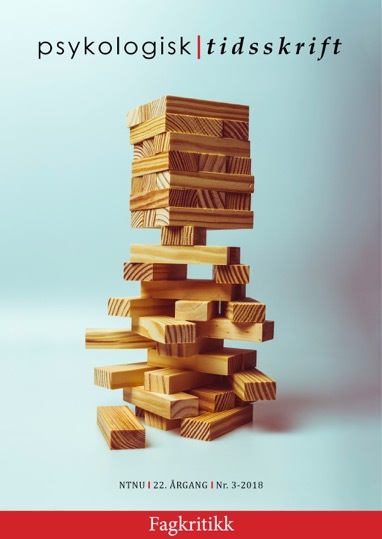 In the context of palliative end-of-life care, it is even more problematic, due to all the factors that may impact on the decision-making capacities of patients. The chapter ends with some reflections on inappropriate terminology sometimes used in connection with assisted dying, and calls for plain language to describe this extraordinarily complex issue. A duty to stay alive? Kant on assisted dying: is it legally acceptable? J.S. Mill on assisted dying: is it morally acceptable? Are people really «the best judges of their own interest»? Materstvedt LJ. (2015). «Misconstrual of EAPC’s position paper on euthanasia». Journal of Medical Ethics; 41: 655-6. Førde R, Materstvedt LJ, Markestad T, Kongsgaard UE, von Hofacker S, Brelin S, Ore S, Laudal M. (2015). 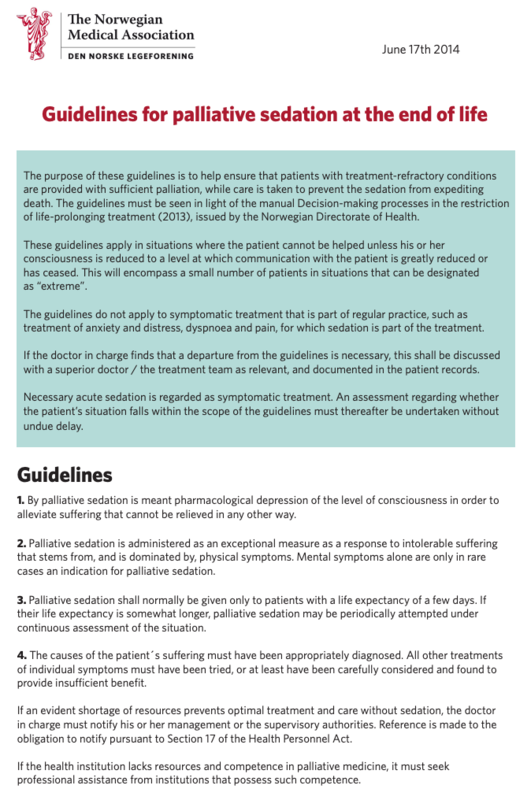 «Palliative sedation at the end of life – revised guidelines». Journal of the Norwegian Medical Association; 135: 220-1. Førde R, Materstvedt LJ, Markestad T, Kongsgaard UE, von Hofacker S, Brelin S, Ore S, Laudal M. (2015). «Lindrende sedering i livets sluttfase – reviderte retningslinjer». Tidsskrift for Den norske legeforening; 135: 220-1. Materstvedt LJ. (2015). «Å stirre døden i hvitøyet». [Stearing death in the eye]. Tidsskrift for Den norske legeforening; 135: 565-6. Materstvedt LJ. (2014). 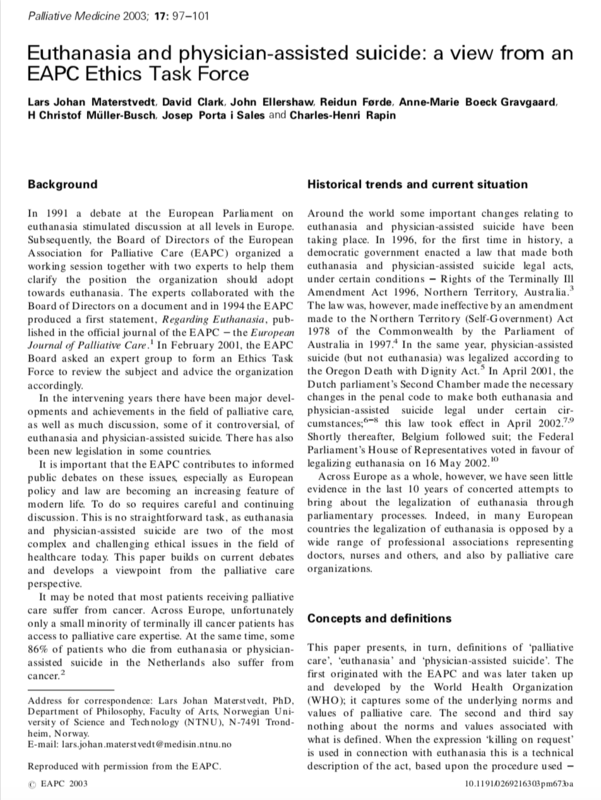 «Palliative care and euthanasia: what is the view of the EAPC?». Editorial. BMJ Supportive & Palliative Care; 4: 124-5. Materstvedt LJ, Magelssen M. (2014). «Liberalisering av fosterdiagnostikk?» Nytt Norsk Tidsskrift, nr 1, s. 106-8. Materstvedt LJ. (2013). «Erroneous assumptions about deep palliative sedation and euthanasia». BMJ Supportive & Palliative Care; 3: 458-9. Materstvedt LJ. (2013). «Palliative care ethics: the problems of combining palliation and assisted dying». 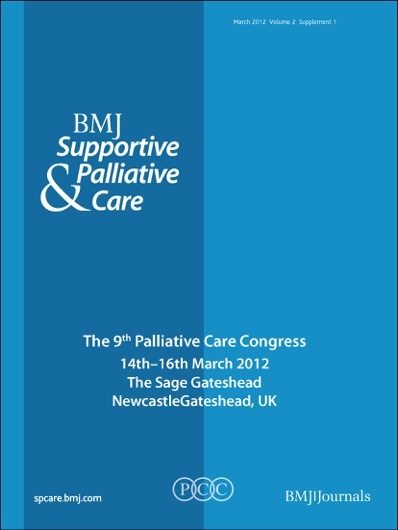 Progress in Palliative Care; 3: 158-64. The performing of euthanasia is now offered as an option by certain palliative care service institutions in Belgium. The approach is known as the «integral» model. Although it is understandable that some physicians are in favour of it, the model is rejected in this article, for both clinical and ethical reasons. Furthermore, the idea of «palliative futility» associated with the model is shown to be incoherent. In countries where assisted dying is legal, palliative care providers should refrain from participating in such practices if they are to remain true to the basic values of such care. The widespread conception that withholding and withdrawing treatment amounts to a «hastening» of death is also rejected. Why do patients request assisted dying? Nordstrand MA, Nordstrand SJ, Materstvedt LJ, Nortvedt P, Magelssen M. (2013). «Medisinstudenters holdinger til legalisering av eutanasi og legeassistert selvmord» [Medical students' attitudes towards legalization of euthanasia and physician-assisted suicide]. Tidsskrift for Den norske legeforening [Journal of the Norwegian Medical Association]; 133: 2259-63. Materstvedt LJ. (2013). «Psykologiske, sosiale og eksistensielle aspekter ved ‘aktiv dødshjelp’» Psykologisk Tidsskrift; 3: 28-34. Magelssen M, Materstvedt LJ. (2013). «Å granske hjerter og nyrer: ultralydens etikk». Nytt Norsk Tidsskrift, nr 1, s. 28-40. Arbeiderpartiet og Sosialistisk Venstreparti har foreslått tilbud om en ekstra ultralydundersøkelse, «tidlig ultralyd», for alle gravide i uke 11–13. Vi stiller oss kritisk til dette dersom formålet er fosterdiagnostikk. For fosterdiagnostikk kan lede til selektiv abort, en praksis som ikke er forenlig med prinsippet om menneskers likeverd. Materstvedt LJ. (2012). «Intention, procedure, outcome and personhood in palliative sedation and euthanasia». BMJ Supportive & Palliative Care; 2: 9-11. Fredheim OM, Materstvedt LJ. (2012). «Behandlingsbegrensning på operasjonsstuen?» [Withholding treatment in the operating room?] Tidsskrift for Den norske legeforening [Journal of the Norwegian Medical Association]; 132: 1361-3. Når man under en akutt operasjon innser at pasienten ikke kan kureres og har svært kort forventet levetid, reises viktige spørsmål om avslutning av behandling. Vi drøfter her kliniske og etiske aspekter ved en slik situasjon, særlig om det bør være et mål at pasienten får anledning til å gjenvinne bevisstheten. Bosshard G, Materstvedt LJ. (2011). «Medical and societal issues in euthanasia and assisted suicide». Chap. 17 in: Chadwick R, ten Have H, Meslin EM, eds. 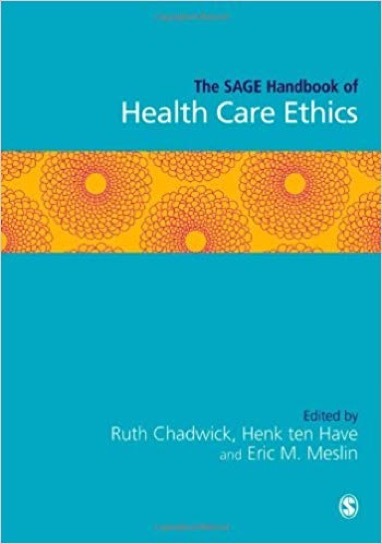 The SAGE Handbook of Health Care Ethics: Core and Emerging Issues. London: SAGE Publications Ltd., pages 205-21. Materstvedt LJ, Førde R. (2011). «Fra aktiv og passiv dødshjelp til eutanasi og behandlingsbegrensning». Tidsskrift for Den norske legeforening [Journal of the Norwegian Medical Association]; 131: 2138-40. Materstvedt LJ. (2011). «What is this thing called medical ethics? A Kantian interpretation». In: Carson SG, Knowles J, Myskja BK, eds. 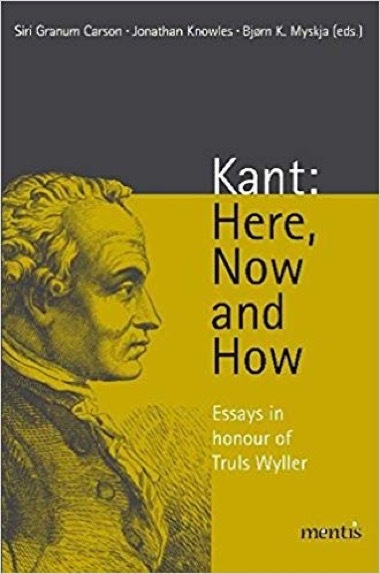 Kant: Here, Now, and How. Essays in Honour of Truls Wyller. Paderborn: mentis Verlag GmbH, pages 207-33. Materstvedt LJ, Bosshard G. (2010). «Euthanasia and physician-assisted suicide». In: Hanks G, Cherny N, Christakis N, Fallon MT, Kaasa S, Portenoy RK, eds. 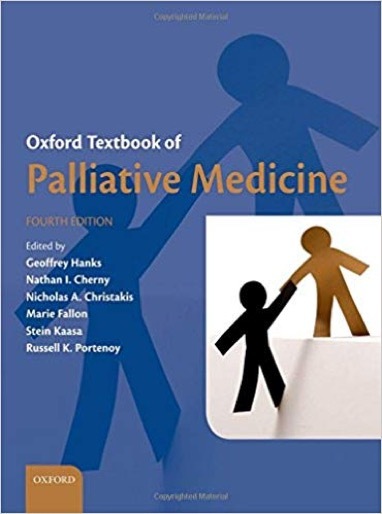 Oxford Textbook of Palliative Medicine, 4th edn. Oxford: Oxford University Press, chap. 5.5, pages 304-19. Materstvedt LJ, Bosshard G. (2009). «Deep and continuous palliative sedation (terminal sedation): clinical-ethical and philosophical aspects». 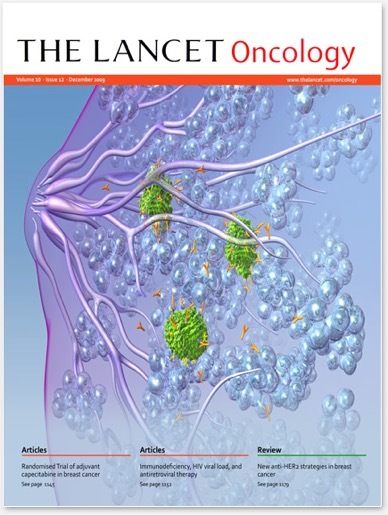 The Lancet Oncology, Volume 10, Issue 6 (June), pages 622-7. Terminal sedation continues to fuel debate. When confronted with a patient for whom terminal sedation is considered a possible treatment option, decision making can be difficult. 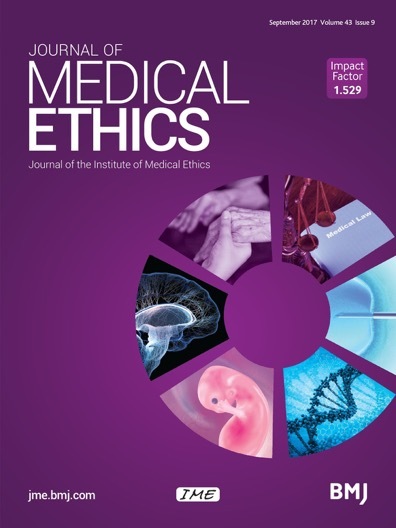 In this paper we focus on the clinical-ethical issues, with an aim to provide clinicians with ways of framing the issue from an ethical point of view. In addition to the clinical-ethical issues, terminal sedation touches upon interesting and complex questions of an essentially philosophical nature. What it means to be a «person» is one such question, and is a topic that is relevant to clinical, daily practice. Accordingly, in the latter part of this paper we draw briefly on selected philosophical positions to elucidate this question. A doctor's belief of what it means to be a «person» might well affect their actions. For example, if a doctor believes terminal sedation involves the destruction of the person, they might not be willing to proceed with it. Materstvedt LJ. (2009). «Inappropriate conclusions in research on assisted dying». Journal of Medical Ethics; 35: 272. Materstvedt LJ, Førde R. (2009). «Retningslinjene for lindrende sedering bør revideres» [The guidelines on palliative sedation should be revised]. Tidsskrift for Den norske legeforening [Journal of the Norwegian Medical Association]; 129: 426-8. Materstvedt LJ. (2009). «Lindrende sedering i etisk og filosofisk lys». 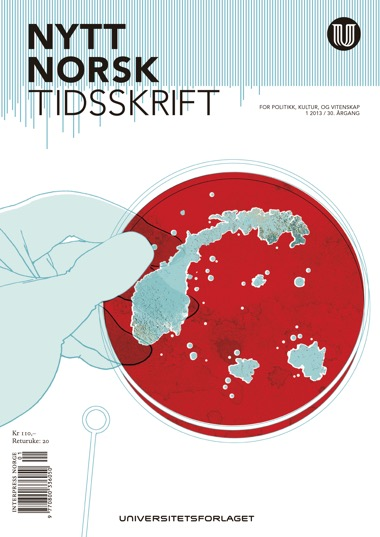 Tidsskrift for Den norske legeforening [Journal of the Norwegian Medical Association]; 129: 1314. Materstvedt LJ, Førde R. (2009). «Flere feil om eutanasi» [Further misconceptions about euthanasia]. Tidsskrift for Den norske legeforening [Journal of the Norwegian Medical Association]; 129: 649. Materstvedt LJ, Førde R. (2009). «Feil om eutanasi» [Incorrect about euthanasia]. 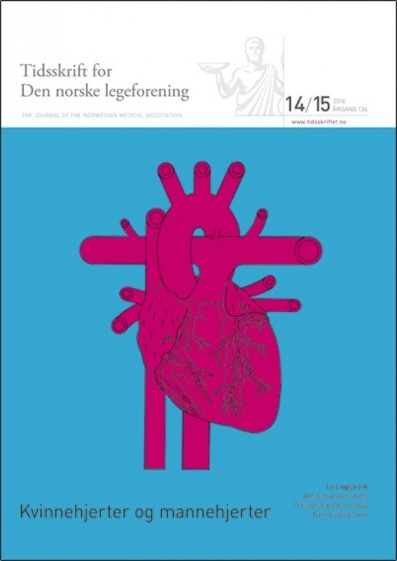 Tidsskrift for Den norske legeforening [Journal of the Norwegian Medical Association]; 129: 121. Materstvedt LJ. (2009). «Nederlandske legers motiver for lindrende sedering» [Dutch physicians’ motives for carrying out palliative sedation]. 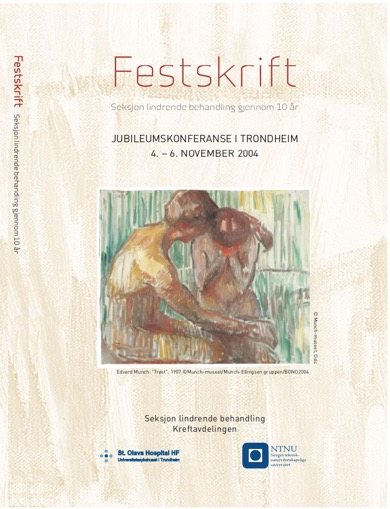 Tidsskrift for Den norske legeforening [Journal of the Norwegian Medical Association]; 129: 2464. Materstvedt LJ, Landmark BT. (2009). «Pasientrettet forskning innen palliasjon: etisk forsvarlig?» [Patient-centred research within palliative care: ethically defensible?] Omsorg. Nordisk tidsskrift for palliativ medisin; 4: 31-6. Landmark BT, Gyllenhammar E, Materstvedt LJ. (2009). «Forskning innen palliasjon» [Research within palliative care] Omsorg. Nordisk tidsskrift for palliativ medisin; 4: 1. Førde R, Materstvedt LJ, Syse A. (2008). «Scandinavia». In: Griffiths J, Weyers H, Adams M, eds. 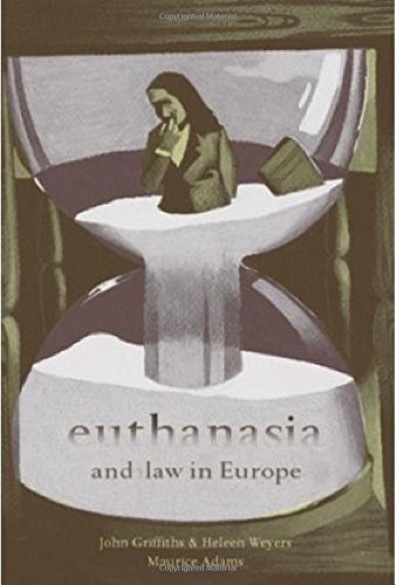 Euthanasia and Law in Europe. Oxford: Hart Publishing, chap. 14, pages 425-41. Bosshard G, Broeckaert B, Clark D, Materstvedt LJ, Gordijn B, Müller-Busch HC. (2008). «A role for doctors in assisted dying? An analysis of legal regulations and medical professional positions in six European countries». Journal of Medical Ethics; 34: 28-32. Materstvedt LJ. (2008). «Hvilken rolle bør leger ha dersom dødshjelp legaliseres?» [What role should doctors have if euthanasia and physician-assisted suicide are legalised?] Tidsskrift for Den norske legeforening [Journal of the Norwegian Medical Association]; 128: 273. Materstvedt LJ. (2008). «Filosofers globale rolle i dødshjelpdebatten» [The global role of philosophers in the euthanasia debate] Omsorg. Nordisk tidsskrift for palliativ medisin; 4: 19-25. Materstvedt LJ, Husebø S. (2008). «Plikt til å dø?» [A duty to die?] Omsorg. Nordisk tidsskrift for palliativ medisin; 4: 1-2. Juul Busch C, Materstvedt LJ, Benzein E. (2008). «Håb» [Hope] Omsorg. Nordisk tidsskrift for palliativ medisin; 3: 1-2. Landmark BT, Materstvedt LJ. (2008). «Symptomlindring» [Symptom relief] Omsorg. Nordisk tidsskrift for palliativ medisin; 2: 1-2. Materstvedt LJ, Førde R, Kaasa S, Borchgrevink PC. (2007). «Eutanasi – definisjonsmessige, etiske og kliniske betraktninger i et internasjonalt perspektiv» [Euthanasia – definitionwise, ethical and clinical considerations in an international perspective]. Kap. 8 i Kaasa S, red. Palliasjon. Nordisk lærebok. 2. utgave. Oslo: Gyldendal Akademisk, s. 153-78. Materstvedt LJ. (2007). «Eutanasi kan være belastende for legen» [Euthanasia can be a heavy burden for the doctor]. Tidsskrift for Den norske lægeforening [Journal of the Norwegian Medical Association]; 127: 3051. Materstvedt LJ. (2007). «Drapsfilosofi» [Philosophy of killing]. Tidsskrift for Den norske lægeforening [Journal of the Norwegian Medical Association]; 127: 2425-6. Materstvedt LJ. (2007). «En nefrolog om eutanasi» [A nephrologist on euthanasia]. Tidsskrift for Den norske lægeforening [Journal of the Norwegian Medical Association]; 127: 1832. Materstvedt LJ. (2007). «Mindre bruk av eutanasi i Nederland» [Decrease in the use of euthanasia in the Netherlands]. Tidsskrift for Den norske lægeforening [Journal of the Norwegian Medical Association]; 127: 1759. Materstvedt LJ. (2007). «Grenser for behandling» [Limits to treatment]. Tidsskrift for Den norske lægeforening [Journal of the Norwegian Medical Association]; 127: 1613. Materstvedt LJ. (2007). «Must we accept death? A philosopher's view». European Journal of Palliative Care; 14: 70-2. Materstvedt LJ. (2006). «Ethical issues»; part of Uganda country report. In: Wright M, Clark D. Hospice and Palliative Care in Africa: A Review of Developments and Challenges. Oxford: Oxford University Press; 216-8. Materstvedt LJ. (2006). «Lost in translation?» European Journal of Palliative Care; 13: 207-9. Materstvedt LJ. (2006). «The EAPC Ethics Task Force on Palliative Care and Euthanasia». European Journal of Palliative Care; 13: 69-71. Materstvedt LJ, Syse A. (2006). «Helsejus og medisinsk etikk» [Health legislation and medical ethics]. Tidsskrift for Den norske lægeforening [Journal of the Norwegian Medical Association]; 126: 1081. Materstvedt LJ, Syse A. (2006). «Døendes rettsstilling» [The legal standing of the dying]. Tidsskrift for Den norske lægeforening [Journal of the Norwegian Medical Association]; 126: 488-9. Materstvedt LJ. (2006). 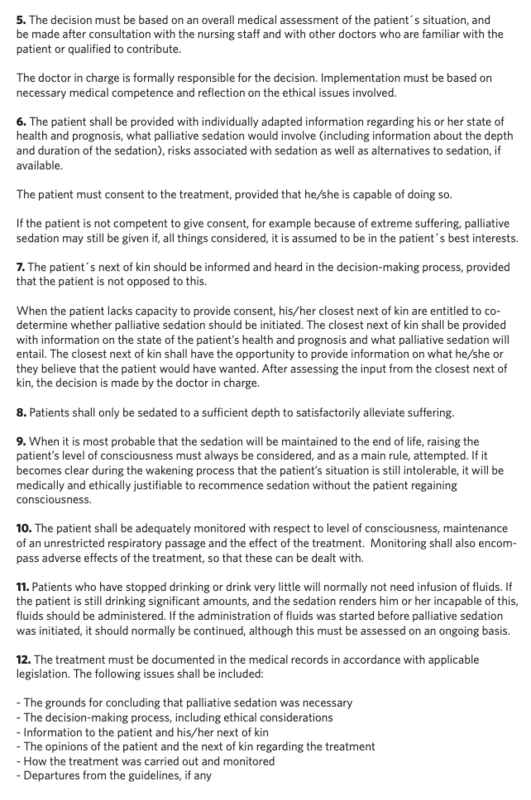 «Lindrende sedering – problem eller plikt?» [Palliative sedation – problem or obligation?]. 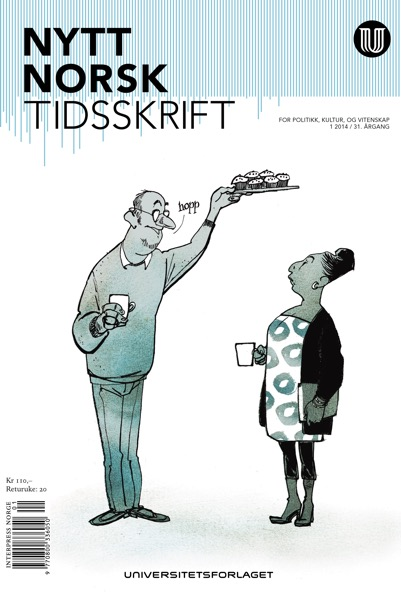 Tidsskrift for Den norske lægeforening [Journal of the Norwegian Medical Association]; 126: 430. Materstvedt LJ. (2006) «Euthanasia and letting die». Palliative Medicine; 20: 49-50. Materstvedt LJ. (2005). «Review of Blinderman D, Cherny N. ‘Existential issues do not necessarily result in existential suffering: lessons from cancer patients in Israel’.» Palliative Medicine; 19: 367-8. Materstvedt LJ, Clark D, Ellershaw J, Førde R, Gravgaard A-M, Müller-Busch HC, Porta i Sales J, Rapin C-H. (2005). «Eutanasia ja lääkäriavusteinen itsemurha: EAPC:n eettisten kysymysten työryhmän näkemys». Suomen Lääkärilehti; 40, vsk 60: 4028-31. Filbet M, Materstvedt LJ. (2005). «Eutanasia ja lääkäriavusteinen itsemurha: EAPC:n kannanotto on suomennettu». Suomen Lääkärilehti; 40, vsk 60: 4027. Materstvedt LJ, Clark D, Ellershaw J, Førde R, Gravgaard A-M, Müller-Busch HC, Porta i Sales J, Rapin C-H. (2005). «Ευθανασία και υποβοηθούμενη από τον ιατρό αυτοκτονία: η άποψη της Εξειδικευμένης Ομάδας Εργασίας για την Ηθική της EAPC». Hellenic Society of Palliative and Symptomatic Care of Cancer and Non Cancer Patients. Kaasa S, Materstvedt LJ. (2005). «Πρόλογος στην ελληνική έκδοση». Hellenic Society of Palliative and Symptomatic Care of Cancer and Non Cancer Patients. Materstvedt LJ. (2005). «Bør man ikke selv få lov til å bestemme hvordan man skal dø?» [Should individuals have the right to decide how to die?] I: Herrestad H, Mehlum L, red. Uutholdelige liv. Om selvmord, eutanasi og behandling av døende. Oslo: Gyldendal Akademisk; 108-32. Materstvedt LJ. (2005). 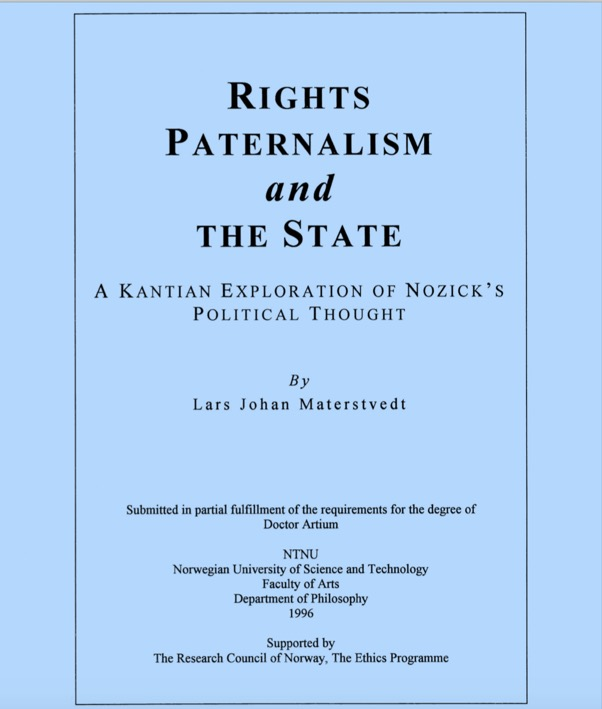 «Nozicks libertarianske ekstremisme og post-libertarianisme» [Nozick's libertarian extremism and post libertarianism]. Norsk filosofisk tidsskrift; nr 3, vol. 37, nr 3: 201-10. Materstvedt LJ, Syse A, Borchgrevink PC. (2005). «Straffelovkommisjonen om aktiv dødshjelp» [Law committee on active euthanasia]. Tidsskrift for Den norske lægeforening [Journal of the Norwegian Medical Association]; 125: 614-6. Materstvedt LJ, Kaasa S. (2004). «Introduksjon til: Medisin, filosofi, medisinsk etikk, og medisinsk forskningsetikk» [Introduction to: Medicine, philosophy, medical ethics and medical research ethics]. I: Festskrift. Seksjon lindrende behandling (SLB) gjennom 10 år. Trondheim: SLB, Kreftavdelingen, St. Olavs Hospital; 132-45. Materstvedt LJ. (2004). «Bruken av autonomiargumentet i dødshjelpdebatten – i lys av 'fire-prinsipper'-tilnærmingen til helseetikk» [The argument of autonomy in the euthanasia debate – in the light of the 'four principles' approach to health care ethics]. I: Festskrift. Seksjon lindrende behandling (SLB) gjennom 10 år. Trondheim: SLB, Kreftavdelingen, St. Olavs Hospital; 192-214. Materstvedt LJ. (2004). «Om vi må akseptere døden?» [Is death acceptable?] I: Ranheim U, red. På talefot med døden – beretninger om livet. Lunner: Uranus forlag; 76-9. Materstvedt LJ. (2004). «Heller god norsk enn dårlig engelsk?» [Good Norwegian rather than poor English?] I: Simonsen DF, red. Språk i kunnskapssamfunnet. Engelsk – elitenes nye latin? Oslo: Gyldendal Akademisk; 61-9. Fra norsk til engelsk = kvalitetsforringelse? Materstvedt LJ, Hegvik J-A. (2004). «Svar til Førde R, for Rådet for legeetikk: Respiratorbehandling og etikk» [Reply to Førde R, on behalf of the Norwegian Medical Association's Council of Ethics: Respirator treatment and ethics]. Tidsskrift for Den norske lægeforening [Journal of the Norwegian Medical Association]; 124: 3264. Materstvedt LJ, Hegvik J-A. (2004). 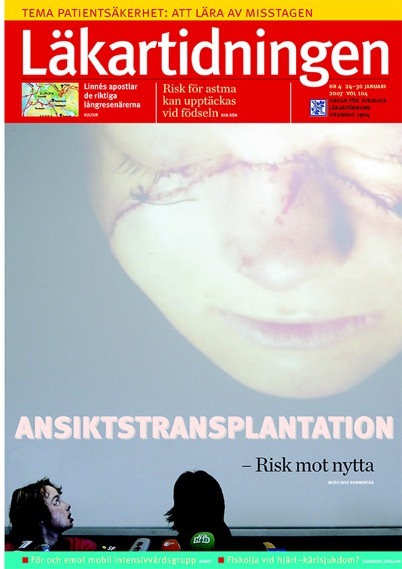 «Svar til Myskja BK: Organdonasjon og moralfilosofi» [Reply to Myskja BK: Organ donation and moral philosophy]. Tidsskrift for Den norske lægeforening [Journal of the Norwegian Medical Association]; 124: 3263. Materstvedt LJ, Hegvik J-A. (2004). «Organdonasjon, elektiv ventilasjon og etikk» [Organ donation, elective ventilation and ethics]. Tidsskrift for Den norske lægeforening [Journal of the Norwegian Medical Association]; 124: 2501-3. Materstvedt LJ, Clark D, Ellershaw J, Førde R, Gravgaard A-M, Müller-Busch HC, Porta i Sales J, Rapin C-H. (2004). «Euthanasie und ärztlich unterstützter Suizid: eine Stellungnahme der Ethics Task Force der European Association for Palliative Care (EAPC)». Zeitschrift für Palliativmedizin; 5: 102-6. Kaasa S, Materstvedt LJ. (2004). «Euthanasie und ärztlich unterstützter Suizid». Zeitschrift für Palliativmedizin; 5: 87. Materstvedt LJ, Clark D, Ellershaw J, Førde R, Gravgaard A-M, Müller-Busch HC, Porta i Sales J, Rapin C-H. (2004). «Eutanasia e suicidio assistito dal medico: il punto di vista di una Task Force sull’etica dell’EAPC». Rivista italiana di cure palliative. Vol. 6 n.1 marzo; 42-6. Kaasa S, Materstvedt LJ. (2004). «La versione italiana del documento dell’EAPC». Rivista italiana di cure palliative. Vol. 6 n.1 marzo; 41-2. Hegstad A-C, Materstvedt LJ, Kaasa S. (2004). «Undervisning i medisinsk etikk: Trondheims-modellen» [Teaching medical ethics: the Trondheim model]. Tidsskrift for Den norske lægeforening [Journal of the Norwegian Medical Association]; 124: 2104-6. Materstvedt LJ, Førde R. (2003). «Intens debatt om eutanasi innen europeisk palliativ medisin» [Intense debate on euthanasia within the European palliative care]. Tidsskrift for Den norske lægeforening [Journal of the Norwegian Medical Association]; 123: 2735-7. Materstvedt LJ. (2003). «Euthanasia: on slippery slopes and vulnerable patients». Palliative Medicine; 17: 650-1. Materstvedt LJ. (2003). «Palliative care on the 'slippery slope' towards euthanasia?» Palliative Medicine; 17: 387-92. Materstvedt LJ, Clark D, Ellershaw J, Førde R, Gravgaard A-M, Müller-Busch HC, Porta i Sales J, Rapin C-H. (2003). «Eutanázia és asszisztált öngyilkosság az EAPC Etikai munkacsoportjának szemszögébool». Kharon Thanatológiai Szemle; 3. Materstvedt LJ, Clark D, Ellershaw J, Førde R, Gravgaard A-M, Müller-Busch HC, Porta i Sales J, Rapin C-H. (2003). «Euthanasie et suicide médicalement assisté: point de vue du groupe de réflexion éthique de'l EAPC». Journal Européen de Soins Palliatifs; 10: 63-6. Materstvedt LJ, Clark D, Ellershaw J, Førde R, Gravgaard A-M, Müller-Busch HC, Porta i Sales J, Rapin C-H. (2003) «Euthanasia and physician-assisted suicide: a view from an EAPC Ethics Task Force». Palliative Medicine; 17: 97-101. Materstvedt LJ, Kaasa S. (2002). 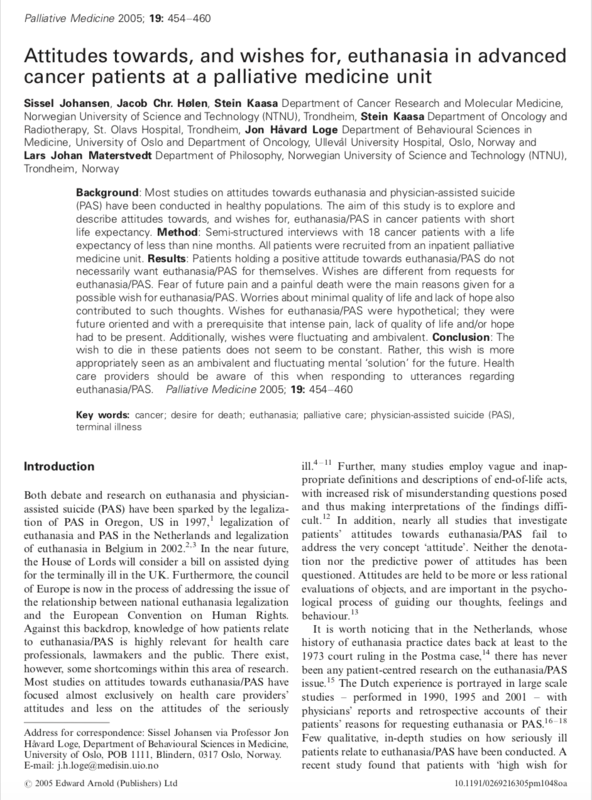 «Euthanasia and physician-assisted suicide in Scandinavia – with a conceptual suggestion regarding international research in relation to the phenomena». Palliative Medicine; 16: 17-32. Materstvedt LJ. (2002). «Livskvalitet – noen filosofiske betraktninger» [Quality of life – some philosophical considerations]. Parabel. Tidsskrift for filosofi og vitenskapsteori; 2: 33-41. «The Experience Machine»: hva om komplett livskvalitet var mulig? Materstvedt LJ. (2002). 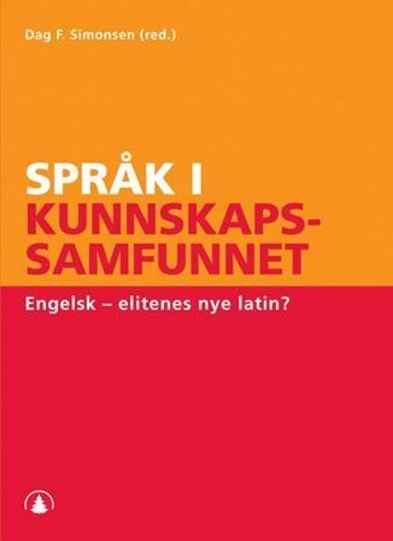 «Engelsk som arbeidsspråk i medisinstudiet – et feilgrep» [English as working language during medical education – a pitfall]. Tidsskrift for Den norske lægeforening [Journal of the Norwegian Medical Association]; 122: 1913. Materstvedt LJ. (2002). «Palliative care in seven European countries». Medicine, Health Care and Philosophy; 5: 307-9. Materstvedt LJ. (2002). «Ethics, palliative care and euthanasia». European Journal of Palliative Care; 9: 215-6. Materstvedt LJ. (2001). «Machiavellis Fyrsten: Menneskets ondskap og egoisme som analytiske bærebjelker i forståelsen av politikk og historie» [Machiavelli's The Prince: human wickedness and egoism as analytical tools in the understanding of politics and history]. Parabel. Tidsskrift for filosofi og vitenskapsteori; 1: 9-24. Er det bedre å være elsket enn fryktet? Om løgnen og sannhetens funksjonalitet: Ronald Reagan som eksempel? Franklin Roosevelt og Pearl Harbor: et eksempel på machiavellisme? Materstvedt LJ. (2001). «Om dødshjelp i Nederland – og om debatten i Norge» [Euthanasia in the Netherlands – and the debate in Norway]. Tidsskrift for Den norske lægeforening [Journal of the Norwegian Medical Association]; 121: 2965-9. Materstvedt LJ. (2000). «Om filosofi og demokrati» [On philosophy and democracy]. I: Dybvig M, Molander B, Øfsti A, red. I et filosofisk terreng. Festskrift til Sverre Sløgedal. Trondheim: NTNU, Filosofisk institutts publikasjonsserie; 34: 139-53. Kongefilosofen på ontologisk og epistemologisk sandgrunn? Materstvedt LJ. (2000). «Aktiv dødshjelp og aktiv livshjelp – noen definisjoner og noen problemer» [Active help in dying and active help in living – some definitions and some problems]. I: Langangen JE, Aakre M, red. Livshjelp eller dødshjelp? Oslo: Verdikommisjonen; 16-35. Kaasa S, Materstvedt LJ. (2000). 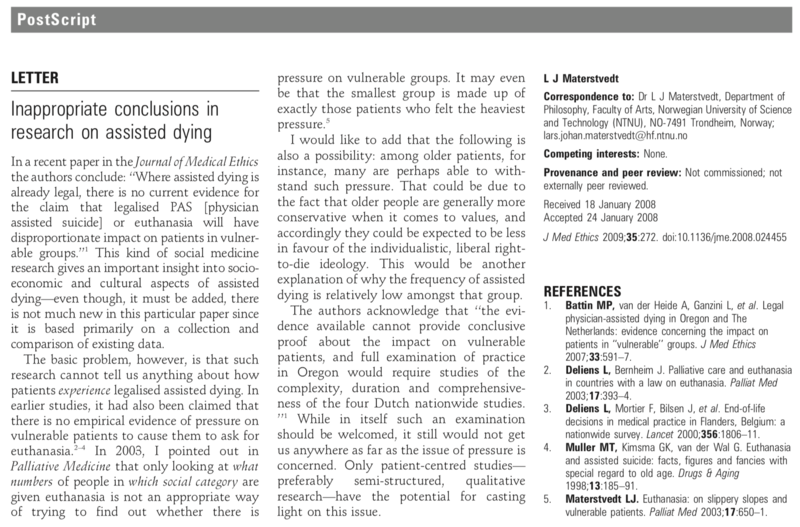 «Forskning innen palliativ medisin» [Palliative medicine research]. Omsorg. Nordisk tidsskrift for palliativ medisin; 2: 14-8. Materstvedt LJ, Kaasa S. (2000). «Er terminal sedering aktiv dødshjelp?» [Is terminal sedation active euthanasia?] Tidsskrift for Den norske lægeforening [Journal of the Norwegian Medical Association]; 120: 1763-8. Materstvedt LJ. (1999). «Etikksider på Internett» [Ethics websites on the Internet]. Tidsskrift for Den norske lægeforening [Journal of the Norwegian Medical Association]; 119: 4251. Materstvedt LJ. (1999). «Sentrale verdier» [Key values]. I: Norges offentlige utredninger – NOU 1999: 2. Livshjelp: Behandling, pleie og omsorg for uhelbredelig syke og døende. Avsnitt 5.4, Kapittel 5, Verdier og holdninger. Materstvedt LJ. (1999). «What philosophers can’t do: boundaries of Apel’s transcendental-pragmatic philosophy». In: Bøe S, Molander B, Strandhagen B, red. I første, andre og tredje person. Festskrift til Audun Øfsti. Trondheim: NTNU, Filosofisk institutts publikasjonsserie; 28: 255-64. Materstvedt LJ. (1999). «Hermeneutikk, begrepsrelativisme og normativitet» [Hermeneutics, concept relativism and normativity]. Parabel. Tidsskrift for filosofi og vitenskapsteori; II/2: 55-70. Kaasa S, Materstvedt LJ. (1999). «Håp» [Hope]. Tidsskrift for Den norske lægeforening [Journal of the Norwegian Medical Association]; 119: 1313-5. Materstvedt LJ. (1994). «Liberaleren Charles Taylor som anti-liberaler?» [The liberal philosopher Charles Taylor as anti liberal?] Norsk filosofisk tidsskrift; 29: 37-59. Materstvedt LJ. (1994). «What’s wrong with Rawls’ political liberalism». In: Høibraaten H, Sløgedal S, red. Festskrift til Ingemund Gullvåg. Trondheim: Universitetet i Trondheim, Den allmennvitenskapelige høgskolen, Filosofisk institutts publikasjonsserie; 19: 148-62.